It’s unclear exactly who invented macaroni and cheese, and when, but you can read food historians’ best guesses about mac and cheese history. What is clear is that Kraft Foods made macaroni and cheese an American staple in 1937 when the company released its “instant” boxed dinner. While Kraft Macaroni and Cheese (or Velveeta, if you prefer) certainly serves its purpose when you need dinner in 10 minutes or less, hopefully the old-fashioned recipes (that call for a homemade roux-based cheese sauce) still have a place in your kitchen today. The Havarti and Monterey Jack-cheese sauce in this recipe does indeed call for a roux, but we added sautéed veggies to the equation. Just use a spatula and whisk to ensure the flour dissolves into the milk. Then, as soon as the cheese is melted, remove the pan from the heat so the mixture stays creamy and doesn’t become grainy. Feel free to substitute or omit any veggies that will absolutely, positively not be tolerated in your household. And if fresh produce isn’t available, you can always use canned or frozen veggies and dried herbs. Just be sure to thaw any veggies before cooking. Melt 3 Tbsp butter over medium heat in a large, oven-safe skillet. Meanwhile, in a small bowl, combine the bread crumbs, parsley, basil, 1/2 tsp salt, and 1/4 tsp pepper. Then, add the melted butter and stir until combined. Set aside. Melt 2 Tbsp of butter over medium heat in the same skillet. Add the garlic, onions, and carrots and saute until the onions are translucent, about 6–8 minutes. Add the broccoli and sauté for another 2 minutes. Add the zucchini, corn, and peppers and sauté for another 2 minutes. Add flour and sauté for another minute. Add the milk and heat until nearly simmering and the mixture has thickened, stirring constantly. Reduce the heat to low and add both cheeses, 1 tsp salt, and 1/4 tsp pepper. Stir until the cheese has melted and then remove the pan from the heat. Add the pasta and stir until it's evenly coated with sauce and vegetables. Top the surface of the mac and cheese with the tomato slices. 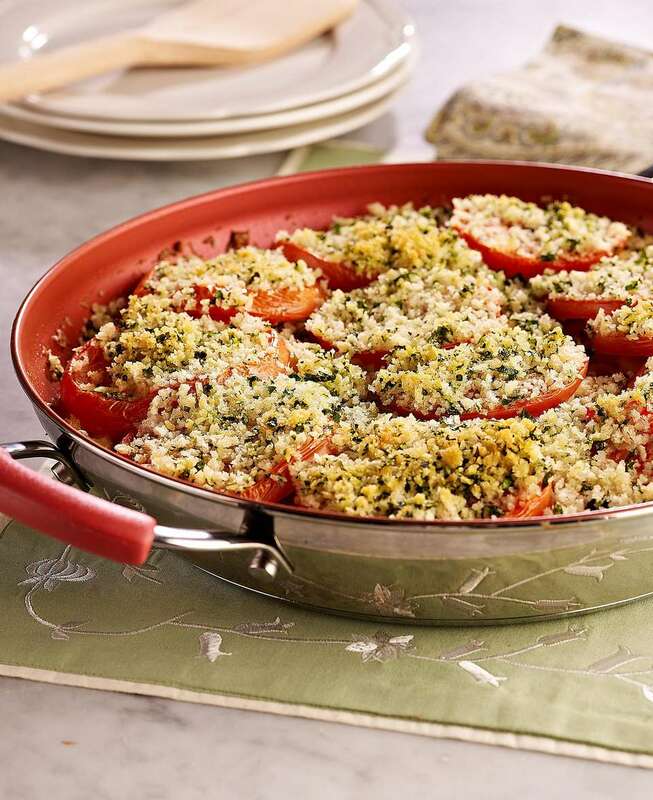 Finish the dish by sprinkling the bread crumb mixture over the tomatoes. Bake for 45 minutes, or until the tomatoes are cooked through and the crumbs are golden.